The Nicaraguan government and Chinese investment group leading the Nicaragua Grand Canal project continue to claim enthusiasm for their dream, but enough fundamental problems remain unresolved to suggest that prospects for its eventual construction are dimming – and the principals are maneuvering to avoid picking up the tab for the expenditures made so far. In a year-end statement last December, President Ortega’s office said the canal project would be one of his government’s top 25 priorities this year and emphasized its benefits to the Nicaraguan people. Hong Kong-based HKND Group had announced in November that it was “fine-tuning” the canal design to address problems raised in an environmental impact study, which would delay the beginning of major excavations and lock-building until the end of 2016. Company officials have since said, however, that construction of a fuel terminal and wharf on the Pacific coast –necessary to bring in the massive equipment the project requires – could start as early as this August. The company still claims that it will complete the canal in 2020 – a prediction that few, if any, outside experts see as feasible. The project faces massive obstacles, with no solutions in sight. The estimated US$50 billion in financing is nowhere to be seen. Chinese investor Wang Jing, who has already spent US$500 million of his own money on the project, lost some 85 percent of his US$10 billion personal fortune in last year’s Chinese stock market correction. (Bloomberg named him the worst performing billionaire of 2015.) Observers believe his losses as well as the problematic environmental impact study have cooled his and other private investors’ support. An initial public offering of shares has been postponed indefinitely. Project managers have yet to demonstrate the need for the canal and propose solutions to significant engineering challenges, such the need for construction able to withstand earthquakes made likely because of seismic faults along the route. HKND says the canal will handle 3,500 cargo ships a year, including ones bigger than those transiting the Panama Canal, but industry experts say there’s no demand for more than will be accommodated by the expansion of the existing canal – and that the United States has no ports capable of receiving the larger vessels. Global warming, moreover, could soon open a faster and cheaper route north of Canada. The “biggest earth-moving project in history” is still looking like one of the biggest boondoggles in history – yet another in a long series of chimera canals in Nicaragua since early last century. The government says that popular support for the project remains about 81 percent, but a survey by Cid Gallup, published in the Nicaraguan newspaper Confidencial in January, showed that 34 percent of 1,000-plus respondents consider the canal to be “pure propaganda.” One quarter believe technical studies have been inadequate and that funding will not materialize. Those sentiments could be reversed somewhat by the appearance of massive excavation equipment and creation of related construction jobs, but support will still be tempered by concerns about persons whose lives are disrupted by the project – and by perennial and profound suspicions that corruption will take the lion’s share of benefits. Some opposition leaders believe HKND’s big push to appear optimistic is to build a case for collapse of the project to be Nicaragua’s fault, so that the company can demand that Managua repay the $500 million that Wang has reportedly spent. The lack of transparency surrounding the project only fuels such speculation. The Nicaraguan government and a Chinese telecom tycoon took a big step on Monday toward the country’s long-held dream of having its own canal, but their prediction of supertanker traffic starting as soon as 2020 seems a bit far-fetched. The project will cost $40 billion and, according to government officials, will create 50,000 jobs immediately, 1 million jobs over the life of the project, and will help lift another 400,000 people out of poverty. President Daniel Ortega’s supporters claim the economy – currently projected to grow at 4.5 percent a year until 2020 without the project – will grow as much as 15 percent a year with it. The Chinese company, HKND, will enjoy a 100-year lease on the canal, with 1 percent of it reverting back to Nicaragua each year. 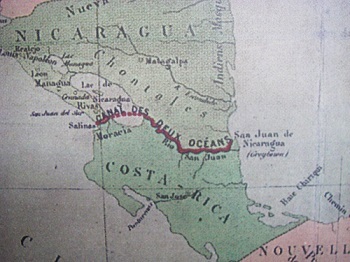 The proposed route for the canal is 278 kilometers long – about three times longer than the Panama Canal – and will be deep and wide enough to handle ships much larger than the “New Panamax” vessels. Officials say the canal would “complement” the Panama waterway, which they say will be overcapacity even after its current expansion, and will save shippers some 800 miles on their way to the U.S. east coast. Opposition from some politicians and environmentalists has been strong. According to media reports, Nicaragua’s Supreme Council for Private Enterprise (COSEP) and other business organizations are generally positive but skeptical, with one leader calling Monday’s press conference “just an initial flow of information.” Congressman Eliseo Núñez of the Independent Liberal Party (PLI), however, has been widely quoted as calling Monday’s announcement a “propaganda game” and blamed the media for generating “false hopes for the Nicaraguan people.” Former Vice President Sergio Ramírez says that handing over national territory for development is a violation of the country’s sovereignty, and other critics claim the project violates 32 provisions of the Constitution. Concerns about damage to Lake Nicaragua, an important source of fresh water that is already polluted, remain. Chinese investor Wang Jing told the press that avoiding environmentally sensitive areas was a major factor in determining the route, and he has promised that a full environmental impact study will be conducted before construction starts. Opponents of the project doubt he will make the report public. Ortega’s statement last year that a Nicaraguan canal “will bring wellbeing, prosperity, and happiness to the Nicaraguan people” may well be right – if the project gets off the ground and so many jobs are created. However romantic that vision is, construction is still far from certain to begin this December, as claimed, or even within the next year or so. Wang says that he has lined up “first-class investors,” but none has been identified yet. In addition, criticism of his business record – opponents say his telecom company is poorly run – has hurt his credibility. And accusations that he’s a stalking horse for the Chinese government, which he says has had “no involvement,” will be difficult to dispel in view of Beijing’s other interests in the region and in shipping. Equally troubling, as the ongoing expansion in Panama has shown, the shadow that corruption and inefficiency cast over any major project tempers optimism and argues against premature celebration.